The Gumotex Twist 2/1 is a tandem version of the popular Twist 1. Coming in at only 13kg, made from the brilliant Nitrilon it has the advantages of great abrasion resistance, wash ability and durability. The Twist 2/1 give you the ability to move the seat configuration to allow a solo paddling position too. The Gumotex Twist 2/1 is a tandem, lightweight, stable inflatable perfect for river, lakes and stretches of calm sheltered water. The Twist 2/1 is designed so all shapes and size of paddler are able to get in and go, feeling comfortable doing so. The Twist has 2 fully removable comfortable seats perfect for allowing paddlers to spend the day out on the water, with a foot support in the front allowing good paddle position for both paddlers. One of the best features of the Twist 2/1 is you are able to reconfigure the seats to allow for solo or tandem paddling positions. 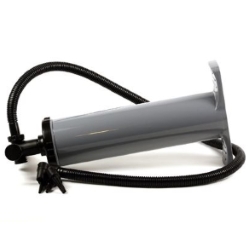 Made for Nitrilon this tandem inflatable is lightweight at only 13kg, durable and easy to wash and dry, all this enables the twist 2/1 to have a long life time when treated correctly. All gumotex inflatable's are quick and easy to pack away once you have finished exploring the water and the twist 2/1 is no different, with this in mind the twist 2/1 will allow for maximum time on the water. Read a review of the Gumotex Twist 2 right here! 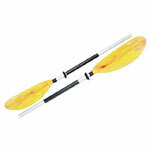 The Riot Distance 2-piece Split Paddle is an ideal paddle for use with inflatable kayaks. It is constructed using an aluminium shaft which is split into two halves and can be set to different angles. Take a look at our full range of paddles here. The Sevylor Compact paddle is a two part paddle. 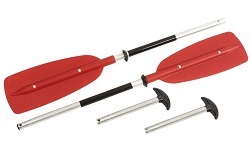 The paddle shaft is aluminium and the blades are robust polypropylene plastic. We offer a delivery service for the Gumotex Twist 2/1 throughout the UK & Ireland to home and work addresses. Unless instructed otherwise, we endeavour to supply the Gumotex Twist 2/1 in 3-5 working days within the UK mainland. Delivery times are estimates based on years of experience; we do not offer a guaranteed timed delivery service. Our overnight service works well for the core more densely populated areas of the UK for Clothing and Equipment orders. However more remote less densely populated areas will not be covered by a next day service. Buy a Gumotex Twist 2/1 online from our website and collect from our shop in Hamworthy, Poole or you can collect from any branch within the Canoe Shops Group. There is no cost associated with in-store collection.